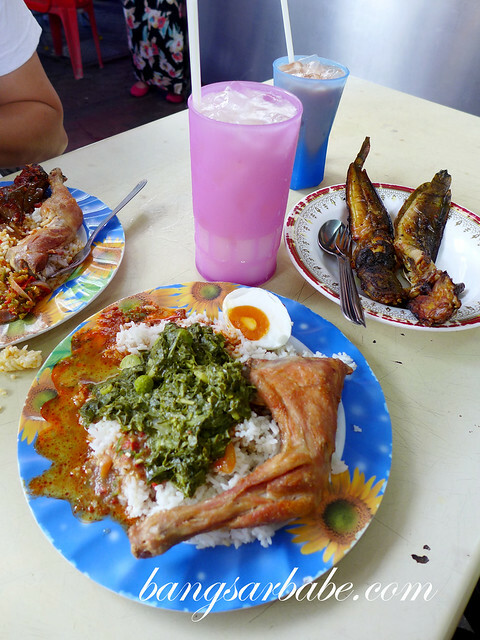 Of late, I’ve taken a liking to Malay nasi campur, especially when the stall serves ayam kampung. 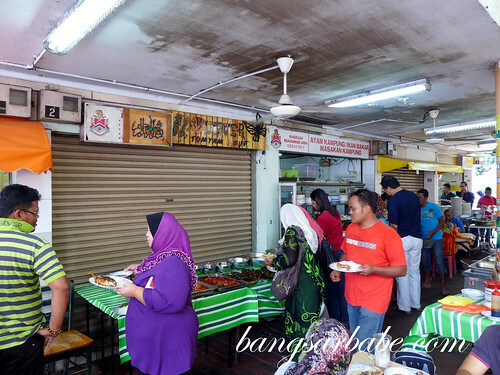 Nasi Ayam Kampung at Medan Selera Veladrome in Cheras is very popular, and while there are a few stalls selling ayam kampung, I like the selection at Gerai No.3 best. This stall closes on Tuesdays, and when that happens, I go to the stall at the corner. 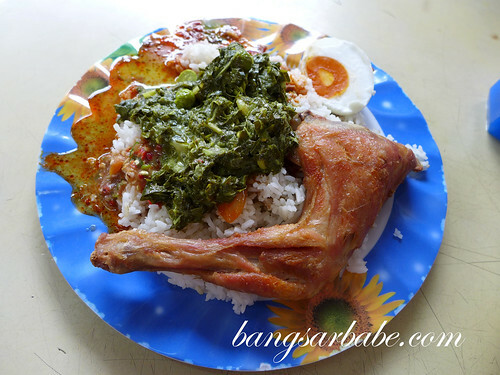 The latter serves pretty decent chicken, but I thought the assorted kuah (gravies) aren’t as tasty. I come here mostly during the weekends and by noon, the place is packed with patrons. 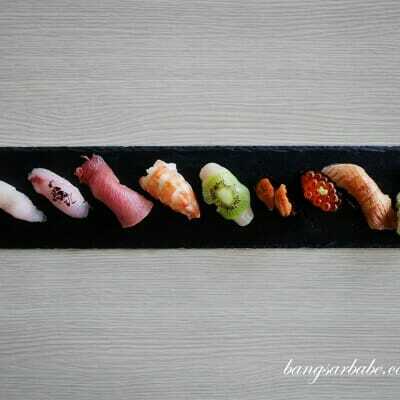 You basically get in line, take a plate of white rice and start piling on the dishes of your choice. I always go for the ayam kampung, pucuk paku, telur masin (salted egg) and ikan keli goreng (fried catfish). And top my rice up with some gulai gravy, sambal ulam and a bit of tempoyak to go with my catfish. 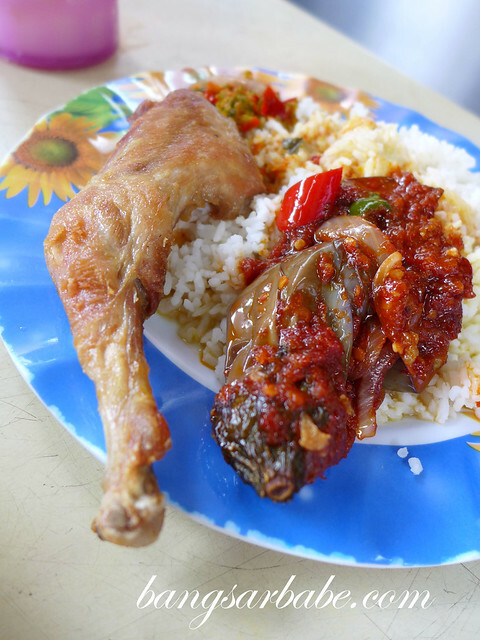 The ayam kampung is pretty small, so it’s common to spot a few people taking two whole chicken legs to eat with their rice. Size aside, my chicken was freshly fried and crisp on the outside with a juicy centre. I love mashing the salted egg up and mixing it with white rice and kuah. 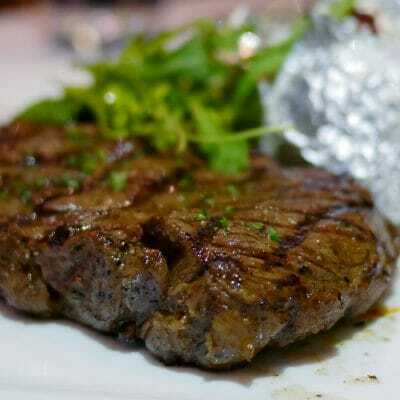 It gives the food more flavour, I feel. I find the pucuk paku masak lemak pretty good here. Compared to my usual nasi campur place in Shah Alam, this was tastier and comes with petai for some added crunch and aroma. rif had the brinjal cooked with sambal cili, and that was pretty tasty too. The brinjal was cooked till tender and the sambal packed quite a punch with a lovely sweetness from the caramelised onions. 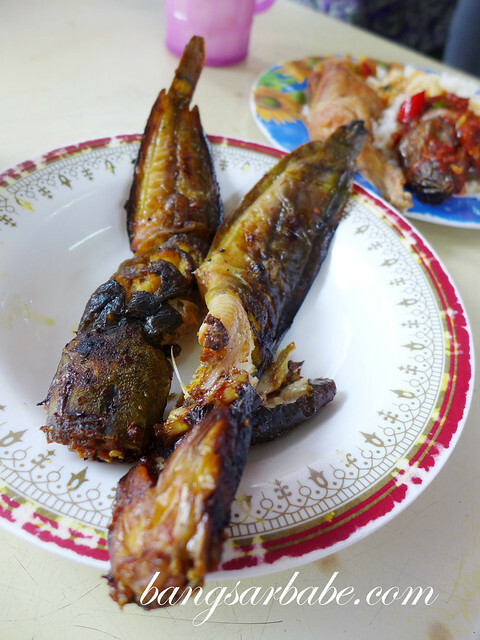 The catfish was crisply fried and very tasty when eaten with sambal and tempoyak. I used to have problems with the fish bones, but am now better and fishing them out. 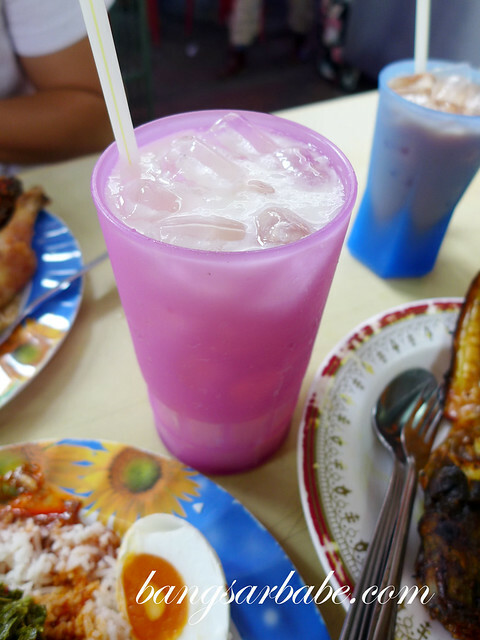 Wash your meal down with their soup sop juice – thick, tangy and sweet with a refreshing aftertaste. Of all the stalls serving soup sop juice, this stall does it best. 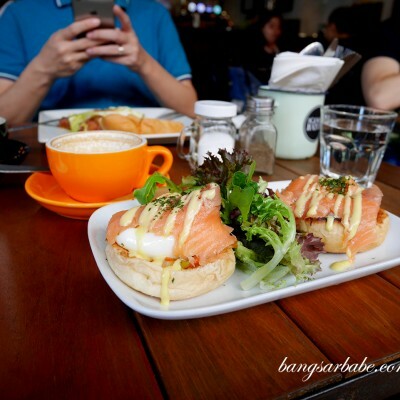 The bill came up to RM29 for all the above plus two drinks. 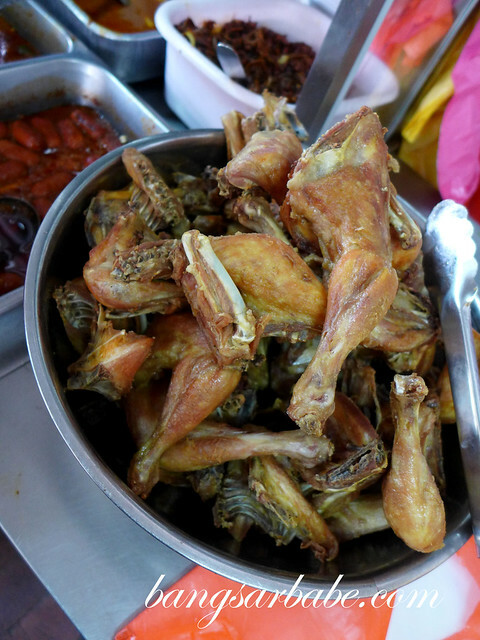 Not exactly cheap, but we did eat one chicken and catfish each, so that’s somewhat reasonable. 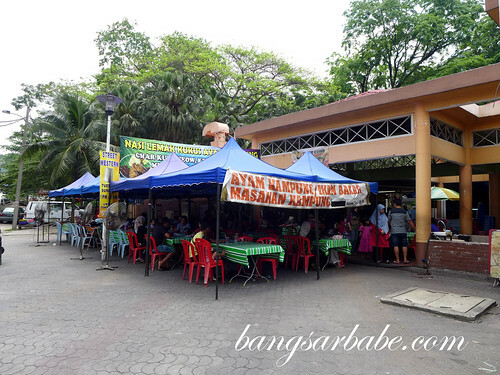 Verdict: If you’re a fan of ayam kampung and good nasi campur, check this place out. I didn’t dare take the huge prawns. Scared I rake up a huge bill hahaha! 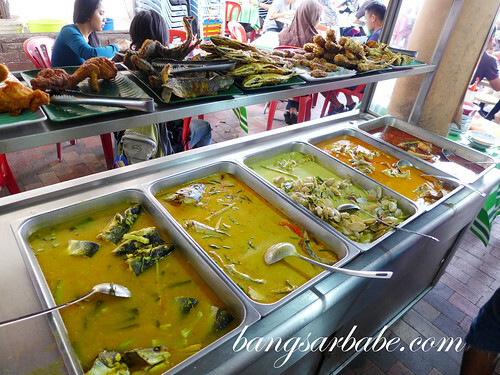 wow….nice malay dishes. Wide spread too. 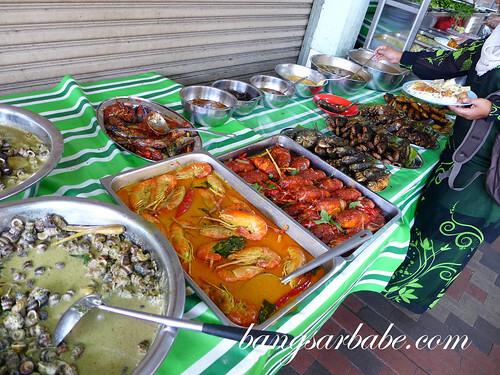 That sambal terung looks DARN spicy!! !